I tend to be one of those people who like to have everything spelled out, cut and dried, able to be checked off my list, and definable. I struggle with those things that are, as I wrote in another article, part of the unwritten order of the Church. So when someone wrote a comment on social media that got my hackles up, I decided to write an article about service and our duties in the Church. And, as usual, the more I learned about both topics, the more I realized I don’t have the answers I thought I had, and that guidelines are often the best that can be given to us. The rest is between us and the Lord. This article contains quotes from multiple Conference talks. The references are all at the bottom of the page. Every one of them is worth another read. Some of them extend back into the early 1980’s, so you may not have been alive when it was first given. In that case, the talks are definitely worth a first read. I posted a question in the Facebook group Latter-day Saint Ministering. I asked how the members of the group were dealing with the ministering program of the Church. 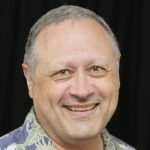 In my personal conversations with people across Utah and Idaho, I had heard of some wards rising up in open rebellion about the new way of teaching in the Church, and about the ministering that replaced home/visiting teaching. There are also wards who have embraced all the new changes and have had wonderful experiences with the new way of doing things in the Church. The response that got me started was a seemingly off-handed remark that they couldn’t be bothered to do ministering in their ward because they were too busy with their jobs and their families, almost as though ministering was optional. It was this seeming dismissal of the prophets divine mandate to minister that got me going. As I mentioned in the first paragraph, I am one who likes to think along clearly definable lines. The prophet commanded it, so it has to be this way. But the more time I have spent in discussion with my wife, and in reading the Conference talks by the Brethren, the more I see that there are no hard and fast rules here about how we are supposed to behave. And I will clarify that remark as I continue. Our priorities are given to us by God, but he doesn’t tell us how to achieve or when to achieve those goals. This makes life messy for all the members of the Church, because we are all in different stages of our conversion process, and many of you reading this are like me, and like things to be easy to define. Letting others wander a different path than we have personally tread is hard to mentally or emotionally process. The rest of this article will be filled with quotes from the Brethren, which I pulled seemingly at random off the Church’s website, www.lds.org. Read what the Brethren are saying, along with any comments or questions I may insert along the way then I’ll have some questions for you to consider at the end of the article. I would love to hear your thoughts in the comments section below the article. I didn’t realize how big President Monson was on the topic of duty. If you do a topic search of General Conference talks under the word duty you will see that about every 10 years President Monson gave another talk on duty. Even other Apostles referred to President Monson when talking about duty. And no, I haven’t included any quotes from President Monson. Those previous remarks were an aside about the topic. My first quote is from Elder Jeffrey R. Holland. President Monson, we love you. You have given your heart and your health to every calling the Lord has ever given you, especially the sacred office you now hold. This entire Church thanks you for your steadfast service and for your unfailing devotion to duty. This is the shortest sermon on the importance of fulfilling our duty I have ever read. Since it has to be included somewhere in this topic, I’ll just say what I want to say here. No Christian outside of this Church is bound by priesthood covenant in the performance of their duties to God and their family. Only in The Church of Jesus Christ of Latter-day Saints are we bound by sacred covenants to perform our proscribed duties to God and family. This means that we can’t get by glibly serving as we wish, expecting the ultimate salvation as reward for our labors. Because all we do is tied to covenants it is required of us to seek the Lord’s direction and to do all we can to be the most responsible stewards in the assignments we are given. Unfortunately for people like me, this means I can’t just tick something off my list because it is so well defined I can put a checkbox next to it and call it done. Our duties in the kingdom are for the duration of mortality, and learning to fulfill our earthly duties prepares us for our eternal ones. We will receive greater eternal responsibilities no faster than we can demonstrate our ability to handle the lesser mortal ones. Here is a quote from Elder Rex D. Pinegar. Instead of home teacher read ministering brother/sister. 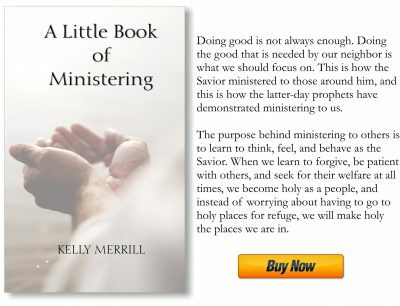 Our duties in our ministering efforts are to be carried out by the “small, kind acts that exemplify the basic teachings of His gospel.” We are duty bound by the covenants we have made to serve one another as ministers in the Lord’s kingdom. Not only does our personal salvation depend on it, but the salvation of others as well. And if you haven’t noticed yet, since President Nelson was sustained as prophet in April of 2018, he has stated repeatedly that the ministering we are doing is intended to bring all of God’s children, on both sides of the veil, into His Church. That means our ministering efforts also have to include those efforts that include those in our families who have already passed through the veil. Family history and temple work cannot be ignored without the dire consequence of us having to face the Lord when he asks us why we failed in our duty to our family members. All of our duties are performed by way of service in the kingdom. Whether they are mundane tasks or heroic gestures, service is the backbone of our behavior and the greatest agent for personal change in our quest for our eternal home. In the following quote Elder Dallin H. Oaks is listing six forms of service. His last on the list is service done out of charity. If our service is to be most efficacious, it must be accomplished for the love of God and the love of his children. There are many levels of service, and there are many motivations for doing service. In this Church we are only really interested in that which will lead us home to the Celestial kingdom, so we focus on learning how to do service in the highest way possible, out of the pure love of Christ. In speaking about duty Elder Joseph B. Wirthlin of the First Quorum of the Seventy had this to say. We must always remember that duty reminds us we are stewards of all that our Creator has entrusted to us. When we accept duties willingly and faithfully, we find happiness. Those who make happiness the chief objective of life are bound to fail, for happiness is a by-product rather than an end in itself. Happiness comes from doing one’s duty and knowing that his life is in harmony with God and his commandments. 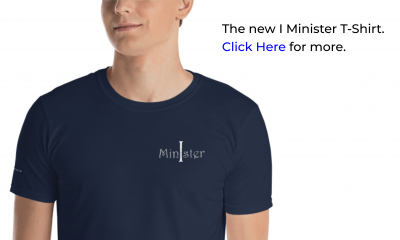 The dismissal of ministering because it was inconvenient was what set me off in the first place. But I’m sure we are all guilty at some time or other of setting aside what we are supposed to do, claiming we do so because we are keeping yet another commandment instead. 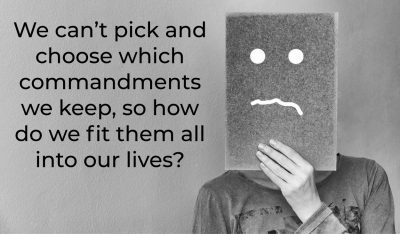 It is almost like we can’t keep all the commandments at once, so we are free to pick and choose which ones are easiest to live today. Perhaps when I no longer have a profession to advance in I will have the time (inclination) to do those other things I don’t want to make time for today. And let’s be honest, there is no one who is really too busy to keep all the commandments. If they truly are that busy then something else must be truly out of whack in their life, and they might want to reconsider their priorities. Elder Jeffrey R. Holland made this remark: “Christlike love is the greatest need we have on this planet in part because righteousness was always supposed to accompany it.” By righteousness, think ministering. We can’t be righteous without doing good, and doing good is what ministering is all about. Charity is all about doing good with the highest motives. As we work on doing the good we should we can also work on our motives. But the doing part has to come first. The following quote came from a Church press release of President Nelson’s talk “5 Lessons Life Has Taught Me” at Safeco Field in Seattle, Wash., on Saturday, Sept. 15, 2018. This came clearly into focus years ago as President Nelson was traveling with four passengers on a flight from Salt Lake City to St. George Utah; during the flight, one of two engines exploded, sending the small plane into a downward spiral. In his dying moments those honors meant nothing to him. What did matter was his wife and children — to whom he was sealed in the holy temple. For my last quote I give you the last part of President Nelson’s talk on service and duty. This is also why the Church engages in humanitarian service around the globe. “Whether we are digging wells in Africa, providing wheelchairs to those in need in Peru, or among the first to respond after natural disasters anywhere in the world, our efforts are designed to help all mankind,” President Nelson said. “As a Church, we need to be doing what the Savior wishes us to do,” concluded President Nelson. “And as a people we need to be looking and acting like true followers of Jesus Christ. Lest you think I am just out to bash the guy who tossed out ministering, seemingly without a second thought, please let me interject here that I understand that mortality has seasons in it. There are times when getting established in the world is important for the temporal welfare of your family. But when does the pursuit of the world’s temporary comforts become a deadly distraction to our personal salvation? At what point does each person need to decide which is more important, the life the Savior wants for us, or the life the world says we deserve? Living the gospel isn’t easy. It requires that we make the covenants that bring exaltation, yes, but at some point in our trying to find our way down the path to that exaltation we need to establish our loyalties. Our loyalties will be what colors our view of the duties we have accepted through covenants, and the service in which we will choose to engage. So my question to you is this: When I feel overwhelmed by the demands of mortality, what are some actionable things I can do to include all my duties and responsibilities to serve in the kingdom? I don’t want to lose my way, but sometimes it is difficult to fit it all in. How do you do it? We’d all love to read your thoughts in the comment section below. Actually, I am now more confused than before. So do we still do home teaching, or has “ministering” replace home teaching. When you have a great and successful system of caring for people, why not continue instead of injecting a state of confusion. If done correctly, home teaching would have worked well for the Church. Unfortunately, too many of the brethren of the Church devolved to a checkbox mentality, instead of a ministering mentality. This is why the Church has gotten rid of the checkboxes. Now when you have your interviews with your priesthood leaders they should be asking you questions about whether you have been praying for your families by name, have you been receiving guidance from the Spirit on how to meet their needs, how have you followed the Spirit in your ministering efforts, etc. These kinds of questions were rarely ever asked before. In the past they were mainly asking if you had visited the family (check), delivered the First Presidency message (check) and had a prayer with your family (check). Does this help a little?